Imagine your wedding, family reunion or corporate event in a unique and stunningly beautiful setting! A huge field nestled between a large pond, madrona trees, lavendar, iris, daisies, dragonflies, swallows on a bluff with fabulous views of Mt. Rainier and Puget Sound. Perfect for small or large groups: camping, weddings, family reunions, corporate events, film production, photo shoots. Accommodates up to 450 guests with parking for 200+ on the premises. 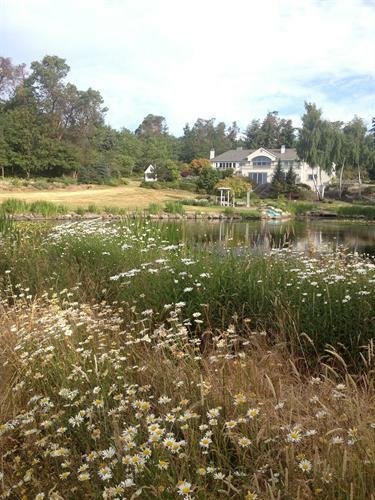 A pristine, private, mostly-forested 40 acre property with an 8+ acre grassy, mowed field area encircles the pond. Ideal for outdoor weddings, reunions, large pic-nics, barbecues, memorials, film production, photo shoots, etc. 220/30 amp power for music. A groom's changing area is attached to the nearby barn, and a lovely bride's changing area/ honeymoon cottage is available also. There is space to land a helicopter and potential for arrival/departure by boat or sea plane at the site, or a small airport on the island that accommodates private planes. Guests who are driving may arrive from downtown Seattle on the King County Water Taxi, or on the WA St. Ferries from West Seattle (Fauntleroy), Southworth (Olympic Peninsula) or Tacoma (Pt. Defiance). 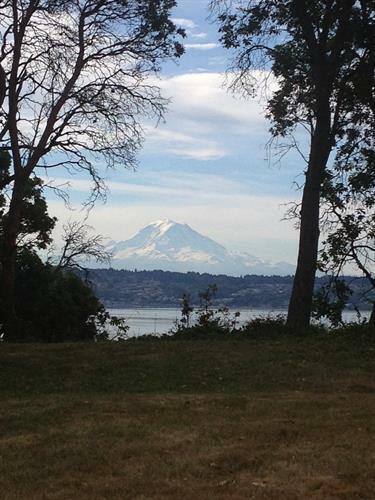 Vashon Shuttle Service can be arranged to transport guests who walk on the ferry. There is a gorgeous12,000 sq. ft. mansion (not available for events, but can be used as a film location or photography venue) that is the backdrop on the hill above the pond. A large staging area on the property with with sink, fridge/freezer makes caterering easy. Affordable rates. Near Point Robinson, technically on Maury Island (but connected to Vashon by a causeway at Portage). A 20 minute drive from either ferry.